For week 4 of the mitts project, I found some bright Red Heart yarn I had left over from some other project I don’t exactly remember. 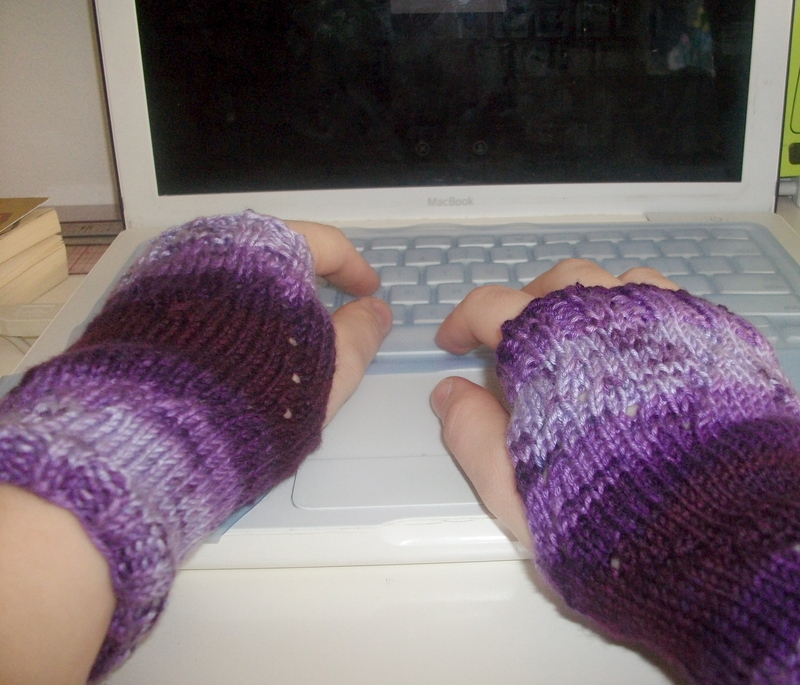 I thought it would go good with some small cables on each side of the back of the hand. The kind of get lost in the colors, but it makes it look rather nice. I managed to knit most of these while babysitting and watching a classic movie marathon on Netflix. Which was good, because I started them at the end of the week instead of the beginning. As always, you can find these and others on my Etsy Shop. 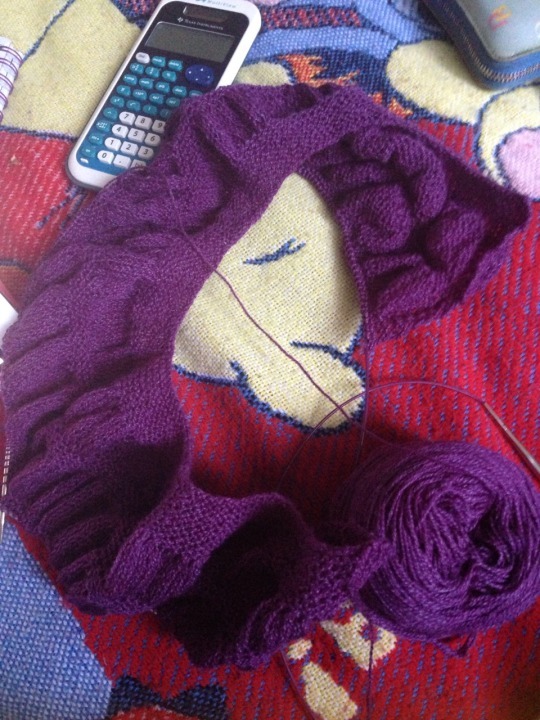 It seems like it’s been a while since I’ve knit something beginning to end. I have a lot of projects lying around in various stages of finishing. There’s a mostly done baby blanket, three mittens waiting to be embroidered at Christmas time (there were four, but one got lost and needs to be remade), and the rest of the mittens that only have ribbing started. But I haven’t sat down and finished anything in a while. Mostly because it either doesn’t need to be done for a long time, or has no deadline at all. This shrug/cape/shawl thing does have a deadline, however. My mom needed it done for her gala at work on April 30. 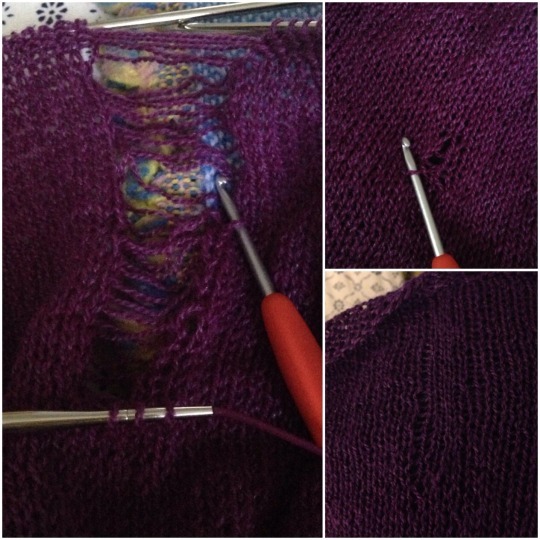 She decided she needed a new one around March 20, so, with shipping time for the yarn from Knit Picks, I had a bit of a time crunch on my hands. 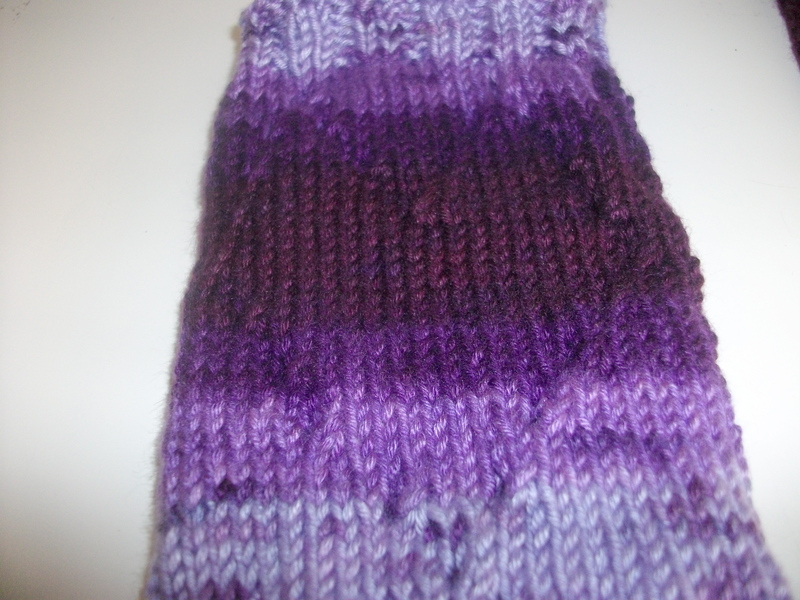 Luckily, she picked the Gloss Lace yarn which is a blend of wool and silk and therefore could be spit spliced together. Which means I only had to weave two ends, the beginning and the end. It worked out fine, so I was able to finish in just over a week. Now it just needs a bath and a dry before I give it to her this weekend and take a final finished picture. Which you will be able to see Sunday on my Instagram or a few days after on my Tumblr. You can find the details on Ravelry here. The pattern is Fairy’s Shrug (Drops 119-17). There’s a purple theme going on here lately. That’s perfectly fine by me. 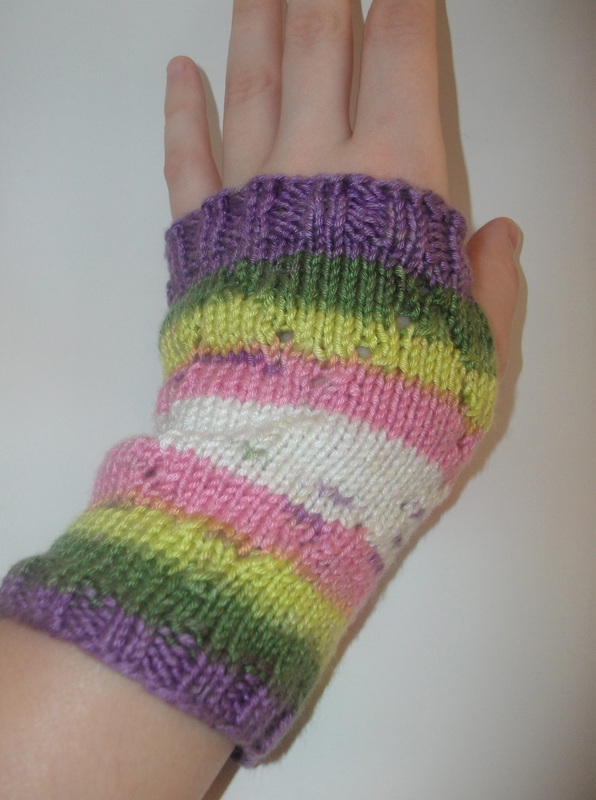 Remember my Self-Striped Heart Gloves? 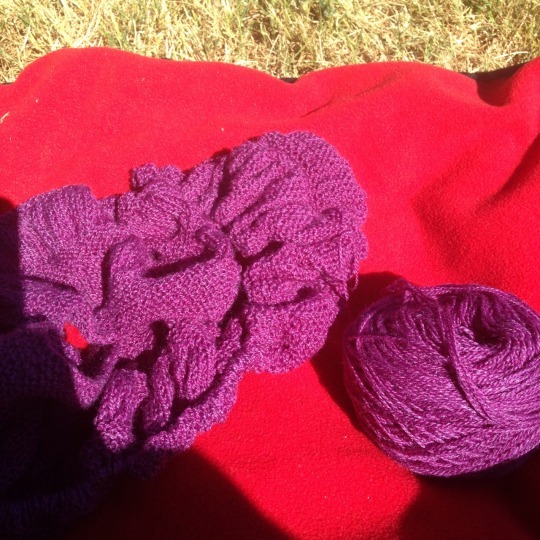 I found another skein of the yarn I used, this time in purple. There’s the same yarn-over heart on top and bottom. These kind of gloves are really good for tasks that require the use of your fingers. Like using a smartphone, or typing. You can buy this purple version by clicking here. They are made from 100% Microfiber Dralon and you can machine wash and dry them. Well, not exactly. But it is a giraffe on a purple shirt. My little buddy (the boy I babysit nearly every day) had his third birthday last month. 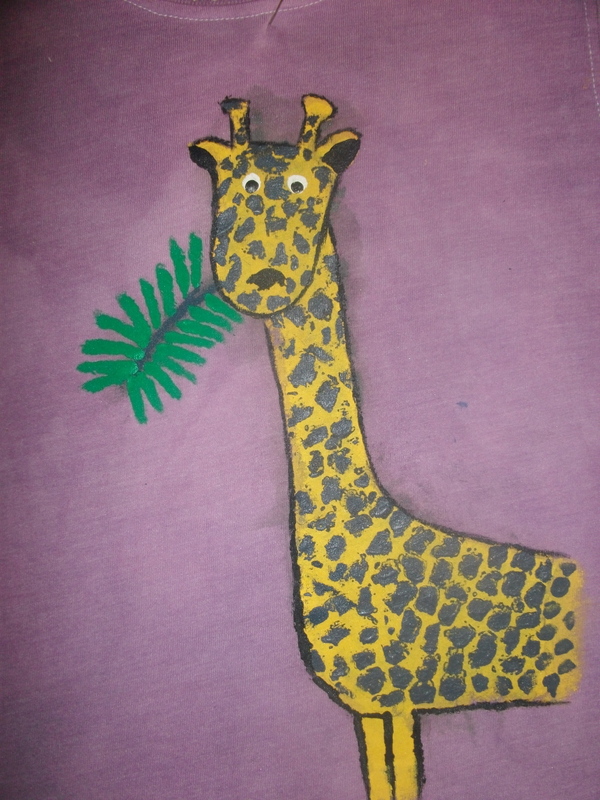 Two things he is absolutely sure of on a regular basis: his favorite color is purple and his favorite animal is a giraffe. In addition to a few cars and some stickers, I decided to make him a shirt. Mostly because I couldn’t find any giraffe shirts at Target. 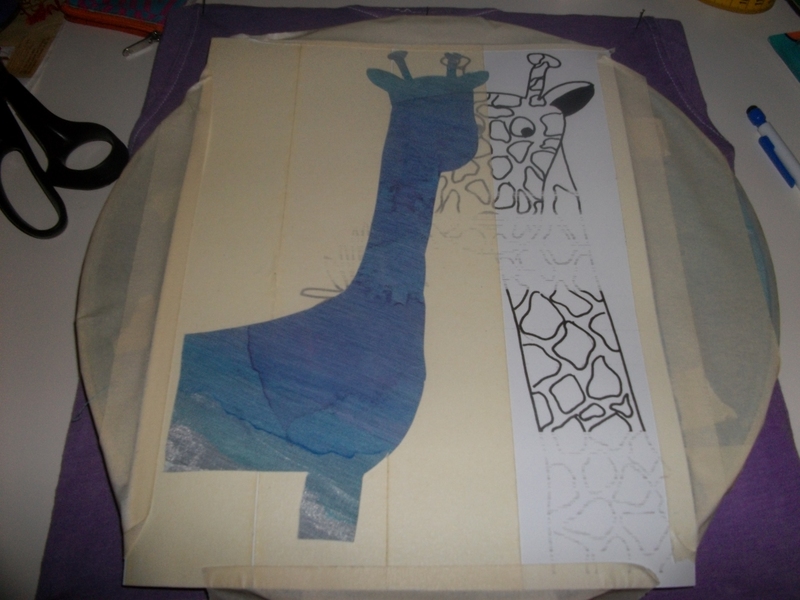 I found a few tutorials online and cobbled together my own screen printing method using curtain fabric, an embroidery hoop, and some handmade stencils. 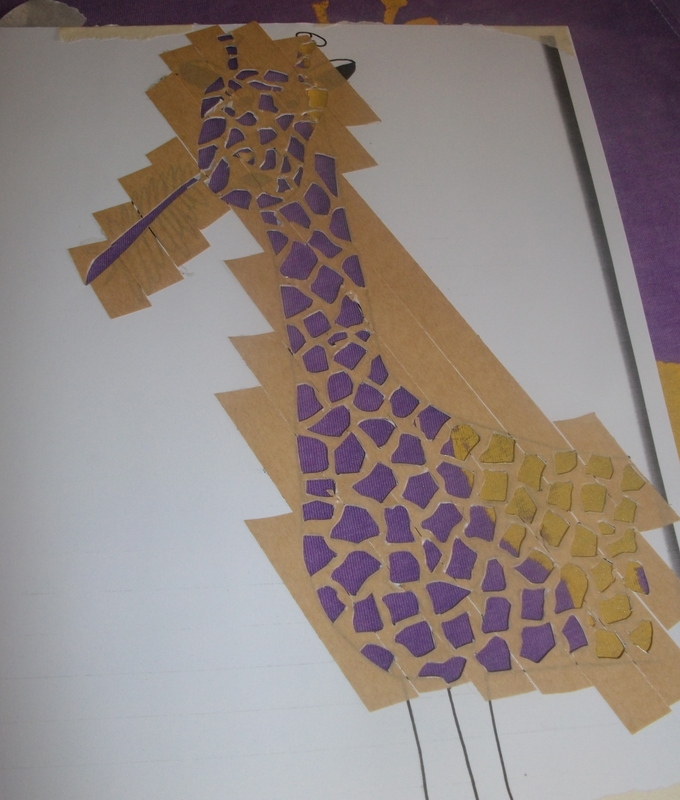 It worked well for the yellow base coat of the giraffe’s body, but not exactly for the spots. The paint didn’t exactly go through the tiny holes. It frustrated me a bit, considering it took so long to cut out every single spot, but it gave me a good basis to paint on the spots that didn’t come out by hand. I painted the outlines, eyes, and leaves as well because by that point I didn’t want to mess with the home-made screen anymore. The curtain fabric was not rigidly woven enough and it started creating large holes. Painting ended up working pretty well. Have you ever tried to silkscreen this way? 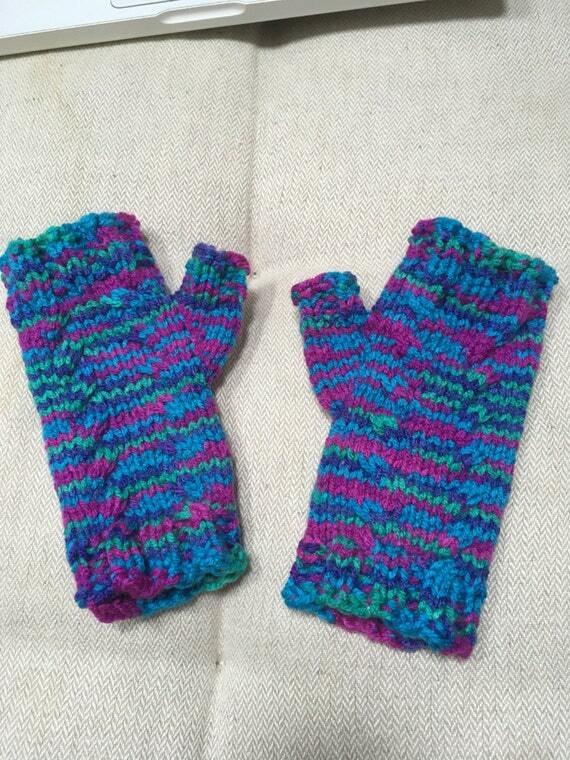 Anyone else like to throw in a hand-made present along with (or in lieu of) store-bought ones? 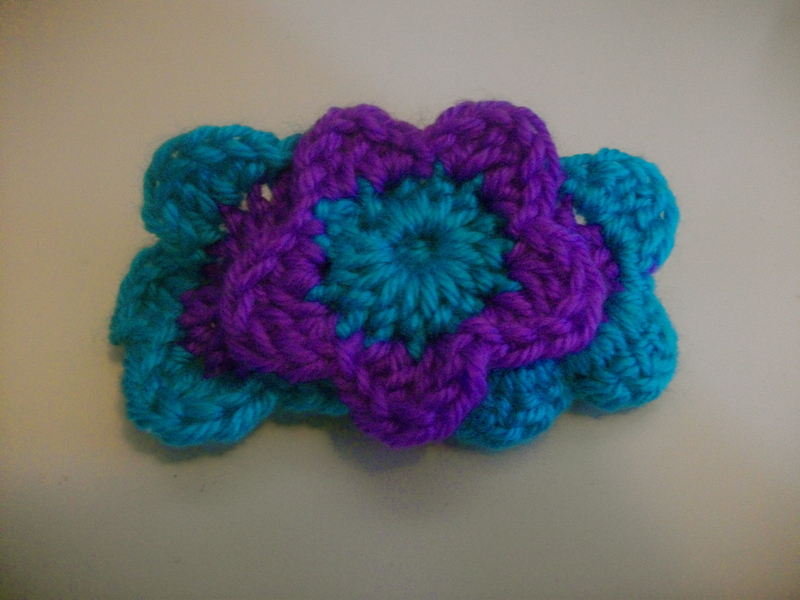 I made a bunch of flowers at one point last year, intending to use them in headbands. Considering the giant plastic bag of them in the yarn basket, I never got beyond the first step. 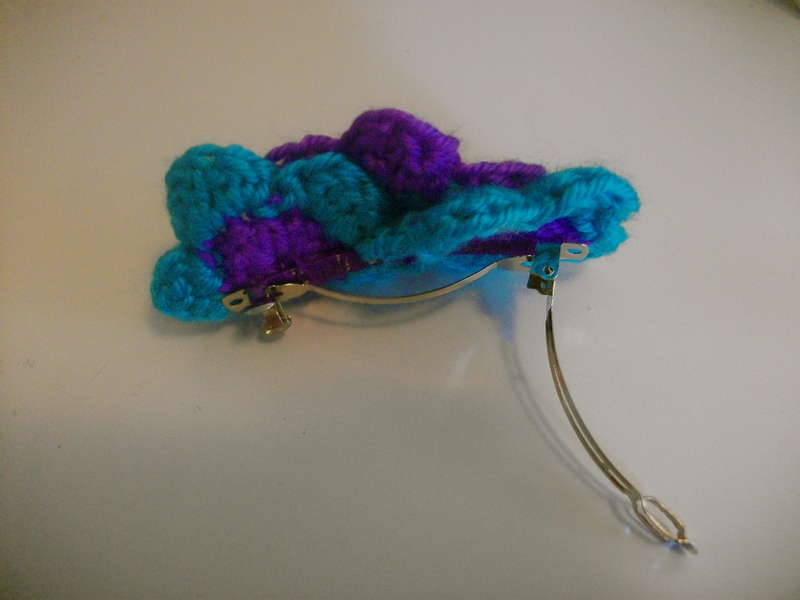 The good news is that I had a ton of coordinating ones on hand when I decided to make barrettes. 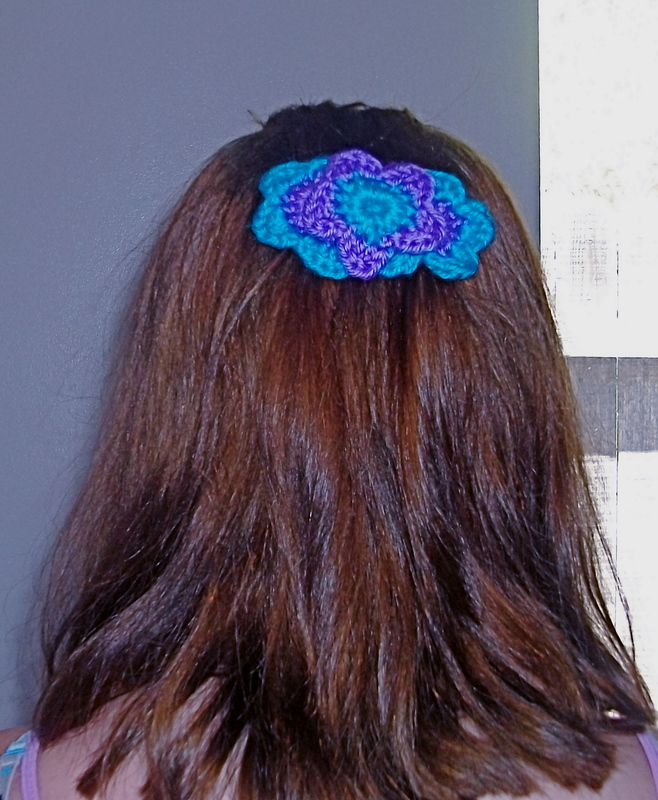 The actual barrette (space for hair) is 2 inches, while the edge-to-edge measurements of the flower part is 4 inches long by 2.5 inches wide and measures about half an inch thick. There are two blue flowers side-by-side with the purple flower on top. 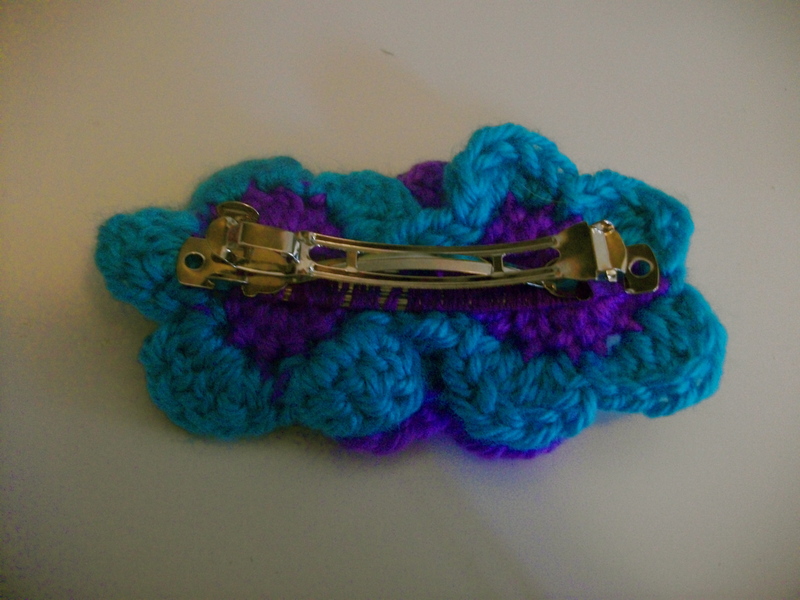 I attached the flowers by wrapping purple embroidery floss around the flat edge of the barrette and sewing the flowers on with it. Want one for your own hair? Buy Here at my Etsy shop. Only $3 apiece. Ever Seen Inside a Sand Dollar? I had been resting my sand dollar on top of my chalkboard (which is quite shakily balanced on two nails and often falls down when I erase) until a few days ago. It fell down onto my desk and split almost exactly in half, spilling the tiny birds between the pieces. It was a ready-made art project. 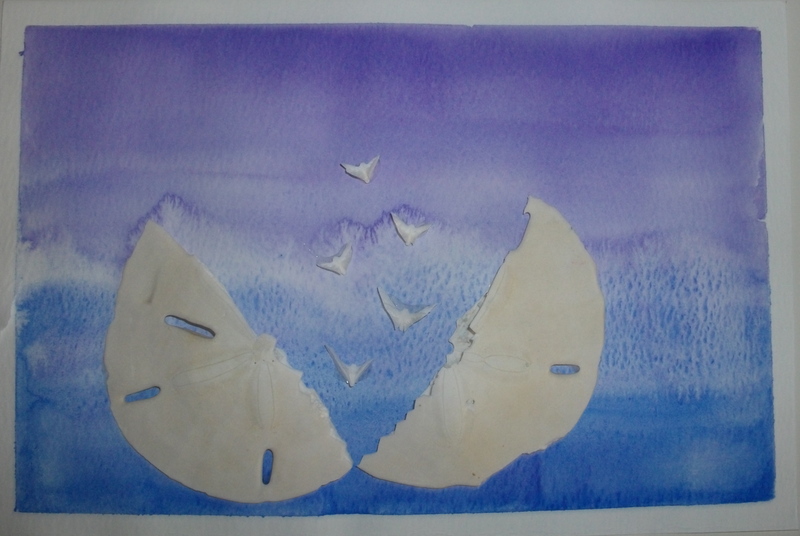 I just used watercolors to create the blue-to-purple wash and then glued the pieces on. I love the fact that there are tiny birds hiding inside the shell, kind of like a flat egg. 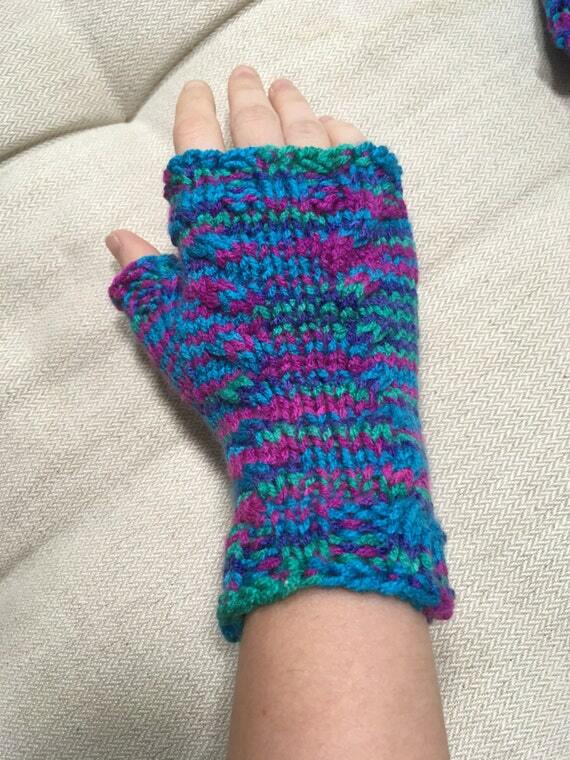 I’ve been on a glove-making kick lately. Especially after my sock-yarn-buying kick a few months ago. I’m really proud of these. 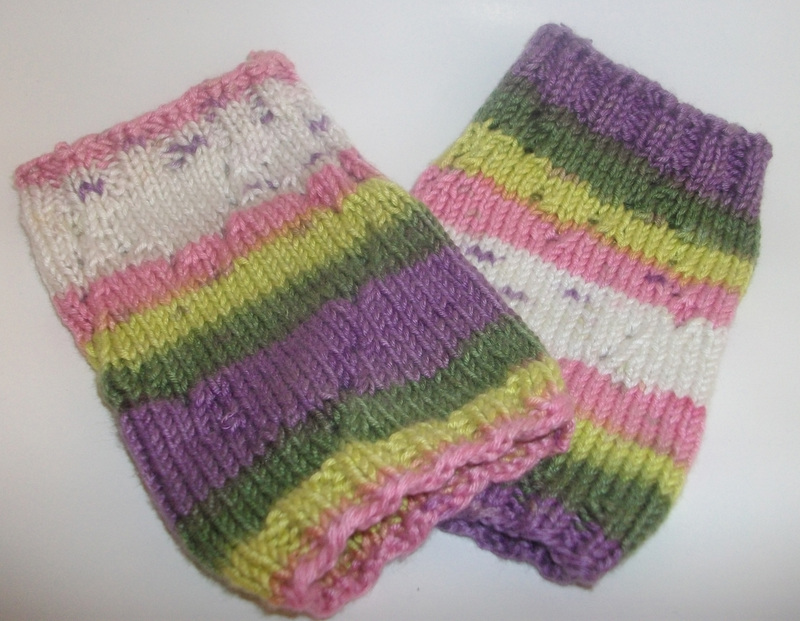 They are made from self-striping Microfiber Dralon yarn. I have no clue what that is, but it sounds cool. 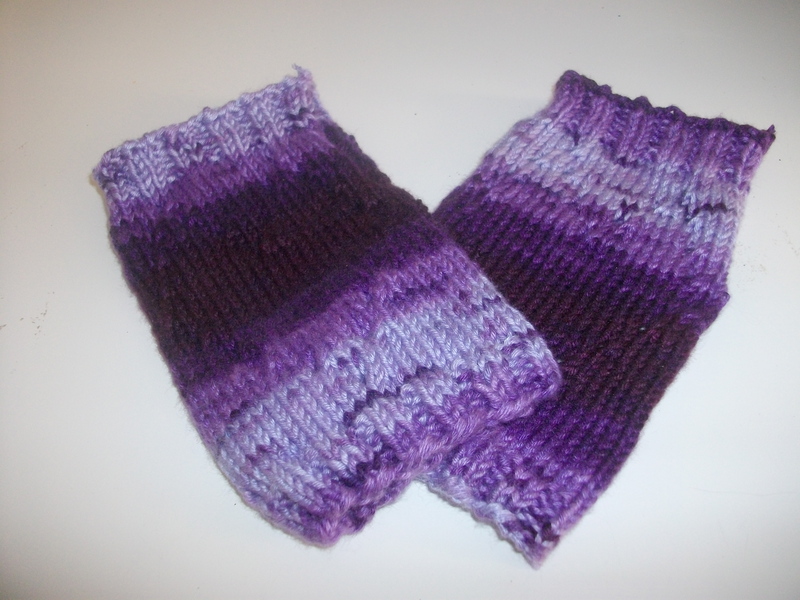 I came up with a pattern to knit them seamlessly. I also created a heart on the top and palm sides. 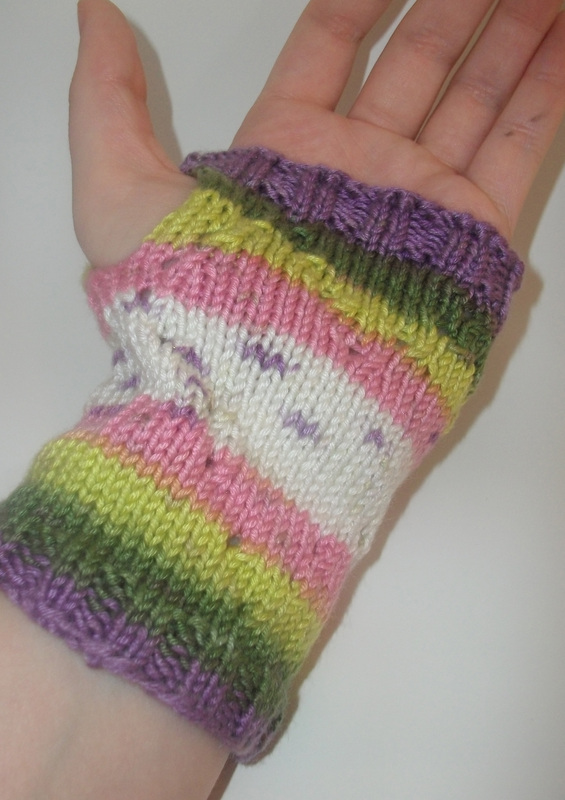 It took a few times of reworking the first glove, but I finally got it down. I even made some in blue. 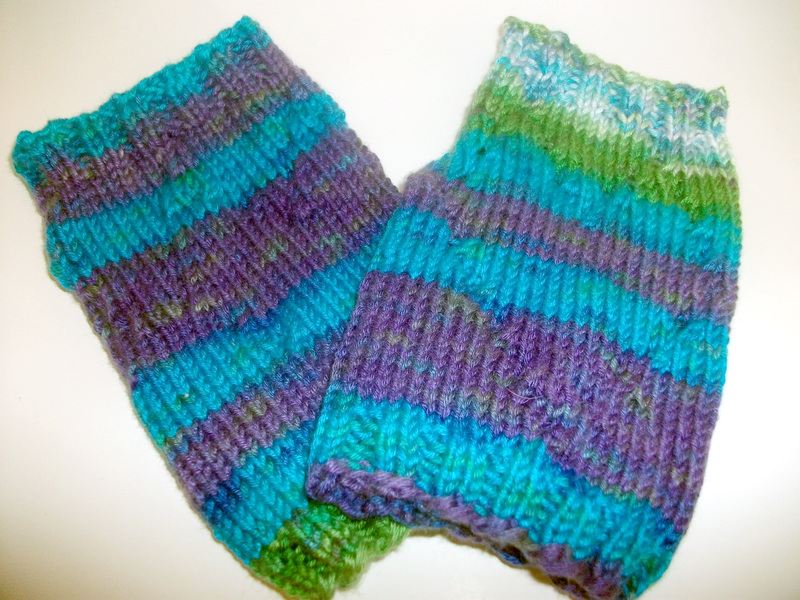 Since the yarn stripes itself, every glove is unique. They still come in pairs, but don’t match stripe for stripe. What are your obsessions lately? These are available on my Etsy site, pink here and blue here. You can also see my write-up of it on Craftsy here.